I recently updated to Sid V.2, but encounter 2 small problems. I changed ID's, put both firmware on both Pic's (Mikes). This was my first idea as well. I still have no explanation why the hex upload doesn't work when the LCD is attached - this is very strange and needs some further analysis. A reason for the not working CAN access could be related to the DeviceID. Each core needs a unique ID, the change_id application helps to set it - was this obvious as well? If yes: are you able to create some pictures of your setup for additional inspirations? Then just attach them to this thread. That was the first thing I did after a got them from Mike. And that worked too, with no problem: after changing the ID of one of the two pic to 1 and press Query the " mios is up and running" message appears, so that is working. The one with ID=1 act as the slave. The message I got when I want to upload was the " #11: midi in overrun error" checked this out on the forum and this was most likely to be a transmission problem. Mostly caused by a mix of operating system and Midi-interface. I am using a Midisport 2x2, which was on the black list, but with Mac os. And I am using Linux. here some pics, they are not that sharp, but this is the best what the Finepix s5700 can do this close by. Last thing I want to add (for now) is some memory. The purple wire is the one for the Ecan. I may be mistaken but there seems to be a wiring problem with the ecan wire in the second photo. As the picture is a bit blurred it is not easy to tell. Then don't go that close with the camera... :rolleyes: You realize that blurry pictures don't help because one cannot see, right? It's better to have lower resolution than that amount of blur! OK attempt no. 2:) Hope this is a little better. Pic.1 Focus more on the left Pcb which is the master with 1K resistor between D3 to +5v and Diode between D2-D3 and the wire for Ecan to slave; attached directly to pin 36 (RB3) op the PIC. Have you checked for solder bridges with a magnifying glass or continuity tester? Sorry I can't see anything obvious in these pics. 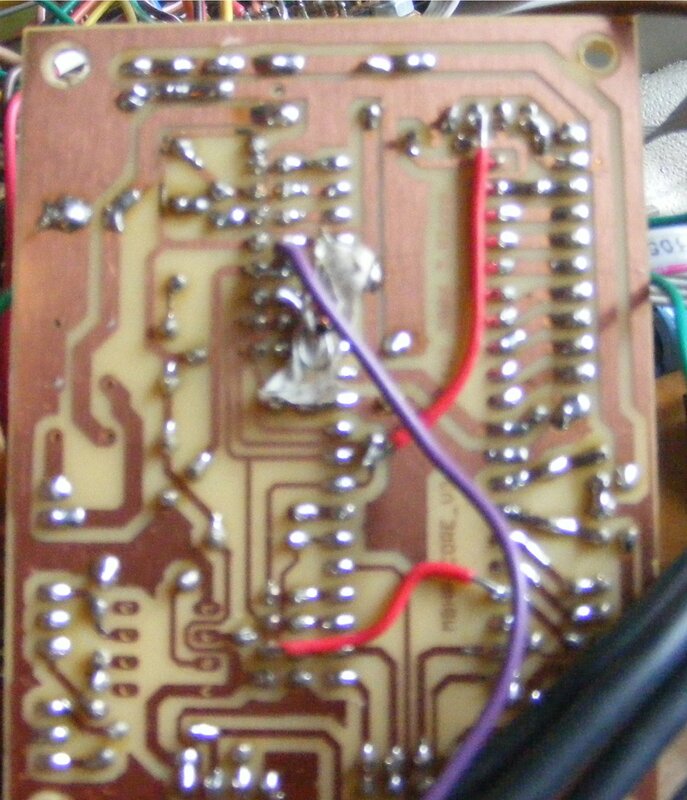 Some solder blobs are a bit too large for my taste, which could indicate cold solder joints, but not necessarily so. Important question: is there a ground connection between the boards? Checked for shortcuts, Visually and with a multi meter, many times, because I thought that should be the problem too, but cannot find one. 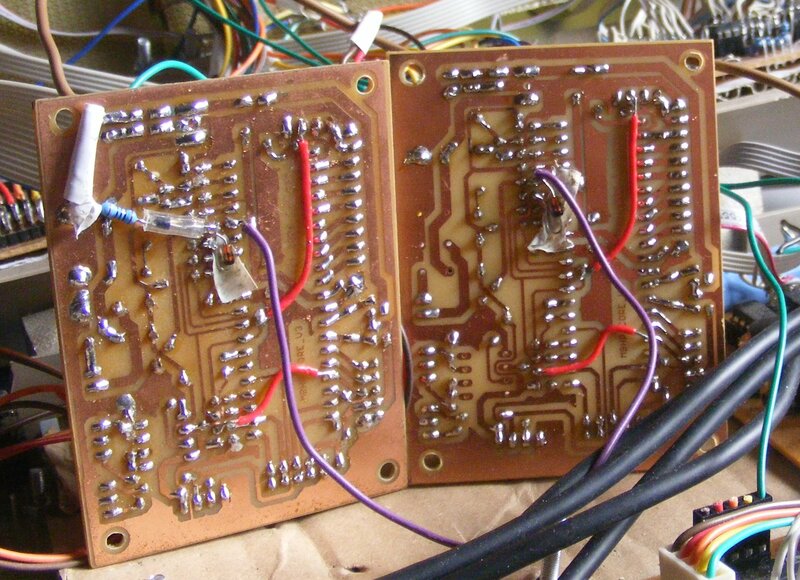 Checked the diodes, but the are fine and in the good direction as well. 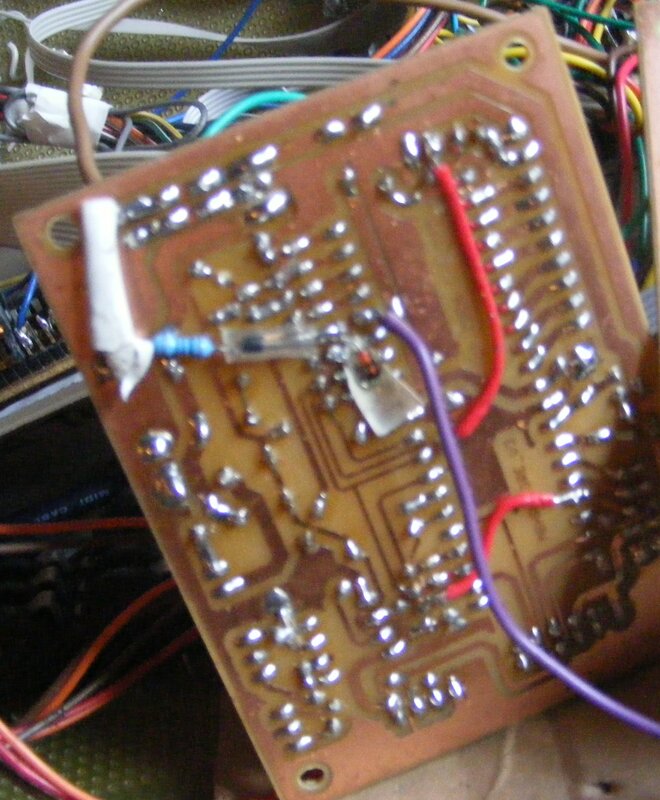 @ Torsten, Yes I also had changed the connection on the J11 midi-in, I just even re-solder it, but nothing helps. again, everything starts up fine, can control everything except SID no.2 is inaccessable, That I cannot upload whith the LCD sceen attached is not the biggest issu for me, although I think the 2 problems must have to do something with eachother. It may be worth trying a different PIC in the second core. Or try reprogramming it from scratch. I do have to upload the same Setup8580.hex to both Pic's, do I? After a few years I still wanted to finish this project, even when the cores are far more advanced by now, I just kept it with the PIC18F4685. So I bought 2 PIC's (thanks again Ilmenator for the burning and quick posting! ), changed the ID headers to 2 and 3 as the would act as slaves 3 and 4, uploaded the latest mios and the SID 8580 Hex. file and unfortunately "Canbus errors: and "No response from MBnet" messages Appear on the LCD. 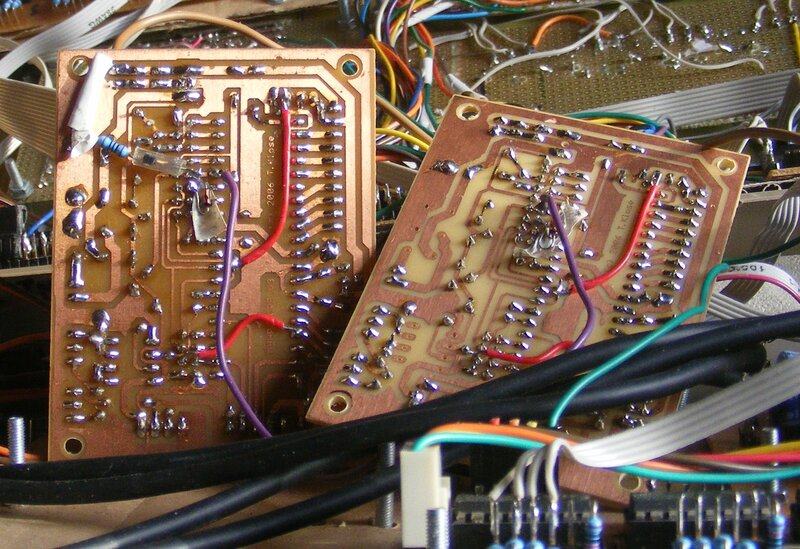 I've spend quite some time examine the boards(all boards are based on Core v.3) for faults or bad soldering and comparing the 2 with the ones that do work but I honestly cannot find a thing. And I am pretty sure it's not the 3 and 4 PIC's, because placing them in the board of Core 2, I can acces them as. So it must be something in the boards right? I hope someone can point me in the right direction and give me the "golden tip" as I really have now clue anymore atm..
boards had different Quartz Crystals :S, I suddenly saw the difference when staring at the four boards, as the ones on the 1 & 2 where 3 times the hight of the ones on 3 & 4. But it never came to me as I thought I had ordered all components back then at one go. Problem Solved! !